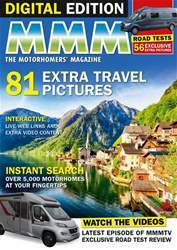 MMM magazine is the only resource motorhome owners need. 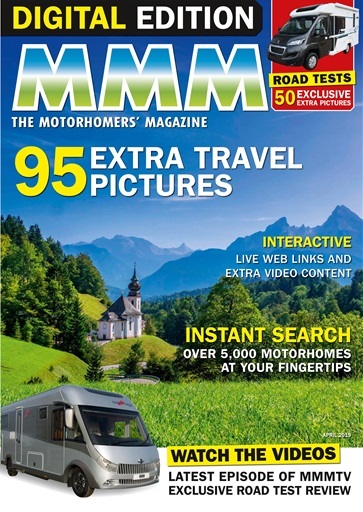 MMM magazine blends together the latest news, reviews and guides on the best routes and sites to take your motorhome. Packed into every issue, discover well written and engaging coverage of all of the motorhome topics that matter, as well as high definition photography of the latest motorhomes and inspirational landscapes. For over 50 years MMM has covered the UK, European and overseas travel. Packed cover to cover with tips, tricks and advice on how to get the most from your motorhome. Regular featured articles, readers letters and competitions are just a few of the many highlights you can expect each month in your latest issue of MMM. Join the thousands of international subscribers enjoying MMM digital magazine subscription today. Welcome to the April 2019 issue of MMM – Britain’s best-selling motorhome magazine. This Spring’s Finest issue is packed with seven wonderful motorhome adventures, including a delightful tour into Bavaria in Germany and a wonderful weekend break in Snowdonia. In this issue, our expert road testers also review four all-new motorhomes and campervans, including a very special luxury coachbuilt for couples built by German manufacturer, Carthago. And, better still you get an exclusive video of this Carthago A-class review just for you. PLUS – we show you where to get the best bargains on new models, the latest news and fun features like Motor Muse Monthly. And, just for this issue, you get a FREE guide to the best campsites in the UK. We hope you enjoy this issue, and happy motorhoming! The Motorhomers’ magazine is packed with buying advice for all varieties of motorhomes, such as dreamer family campervans or low profile coach builds from Eura Mobil. 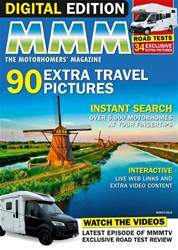 For the last 52 years, MMM magazine has been the best selling motorhome magazine. Reliable buying and selling advice, alongside technical road tests and reviews in every issue, can help you get the most from your motorhome. This magazine covers global travel features for the most beautiful countries to motorhome through. Adventures to the Italian lakes or fascinating tours of the industrial South Yorkshire, wherever you like to explore with your motorhome, MMM has valuable features you will delight in. 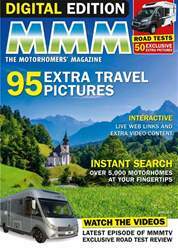 Inspirational travel tales from real and genuine motorhomers in every issue, as well as short breaks or month long adventures - MMM has all the advice you need to get you and your motorhome around safely. MMM’s technical team works hard to answer readers’ questions and explain everything you need to know about keeping your motorhome tyres and wheels in tip-top condition. 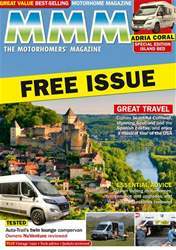 Published monthly by Warners group to support and build the motorhome community. MMM back issues can be ordered as required.